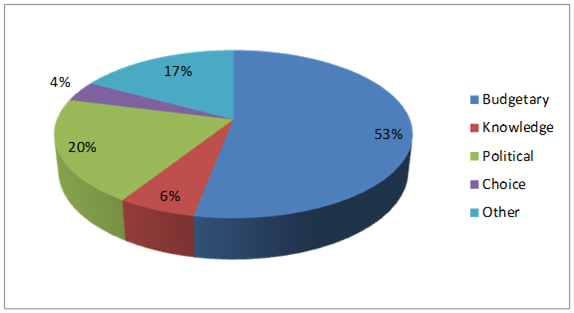 The second question asked how many room-projects each of us is involved in this year (2011) as a function of their total equipment value. I was surprised by the sheer volume of projects. 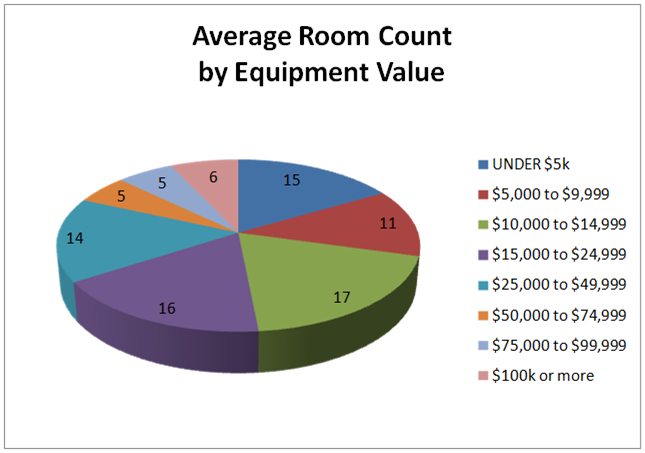 For 2011 survey respondents will be involved in projects that include more than 2500 rooms cumulatively, with greater than $50M in total equipment value. 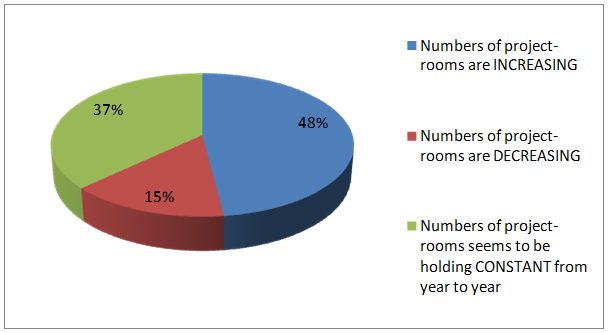 That’s an average of 89 rooms a year. We are clearly part of a very prolific little corner of the audiovisual world. Our work, however, does skew a bit towards smaller projects. 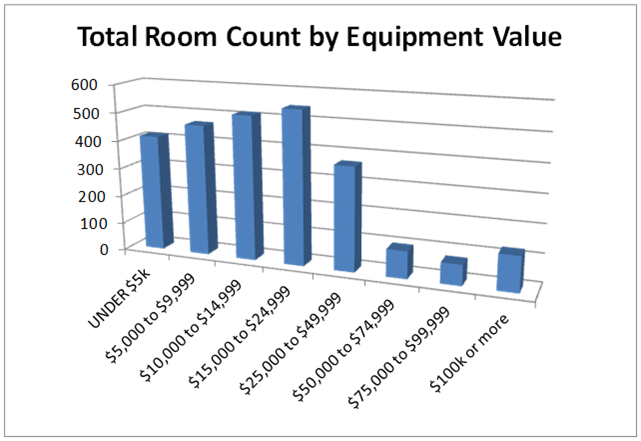 About 60% of the rooms have a total value of $25K or less. Just over a quarter of our room-projects were valued at $10K or less. Meanwhile, projects over $50K in value will only make up a paltry 16% of our involvement. I know here at UCLA a high percentage of my projects end up in these lower categories also, doing quite a few incremental upgrades in the typical year. We choose more frequent small upgrade over fewer big upgrades. We find that it helps keep our systems a bit more uniform across campus. The smaller projects are also easier to schedule in between the classes that we typically dodge for all but a few weeks throughout the year. The high number of small projects, however, raises some questions…. Are you regularly building out complete, new systems for those smaller dollar amounts? Do you use one of the many “packaged” systems out there where many of the core AV system components come pre-kitted and ready to “drop in”? Is it possible that the proliferation of these turn-key packages that we’ve seen in the last few years may be facilitating many of these smaller projects? What PERCENTAGE are these projects of ALL learning space projects at your institution’s location? With 80% of us being involved in all – or the majority – of classroom technology projects, we are clearly the go-to folks for learning technology at our respective institutions. How has the QUANTITY of project-rooms that you have been directly involved in (i.e. your project workload) been trending from year to year? This question revealed a surprising trend: almost 50% of the respondents are seeing our project workload increase, despite many of our budgets getting cut. This is good news certainly, but still perhaps a bit surprising given the state of the economy. What could be behind this trend? Is our workload going up as we are roll out technology to additional, previously untouched spaces? Is our refit activity just catching up with us our systems age? Are we actually moving work in-house that was previously farmed out to integration firms and consultants? What do you see as the SINGLE BIGGEST OBSTACLE for increasing your involvement in learning space projects at your institution’s location? To no one’s surprise, more than 50% of us said that budgetary issues are our biggest obstacle to getting involved in more projects. Budgetary. My department has insufficient resources (funds or personnel) to contribute these in-house services more broadly. Knowledge. Our skill set is insufficient to do the work. Political. There are dark forces plotting against us, thwarting our every move. Choice. Why bother when we can farm it out to contractors. The “other” option included some interesting comments…. Do these results reflect what you have experienced? Are there additional points that have been overlooked? The major difference we see in designing, installing and programming in house is the quality of the programming work. For instance, outside integrators quote a programming hourly rate per job normally and they do the minimal work to get the system running. They rely on us to make sure we can catch all of the punch items and errors, then we those problems fixed remotely. If our programmer is working on it, he might spend 3 or 4 days ensuring that all errors and glitches are removed, ensures all connectivity to RoomView is working, and adds in additional error checking, such as sync checks and auto off at midnight. Our programmer is not rushed and he is able to finalize a project without worrying about coming under budget.